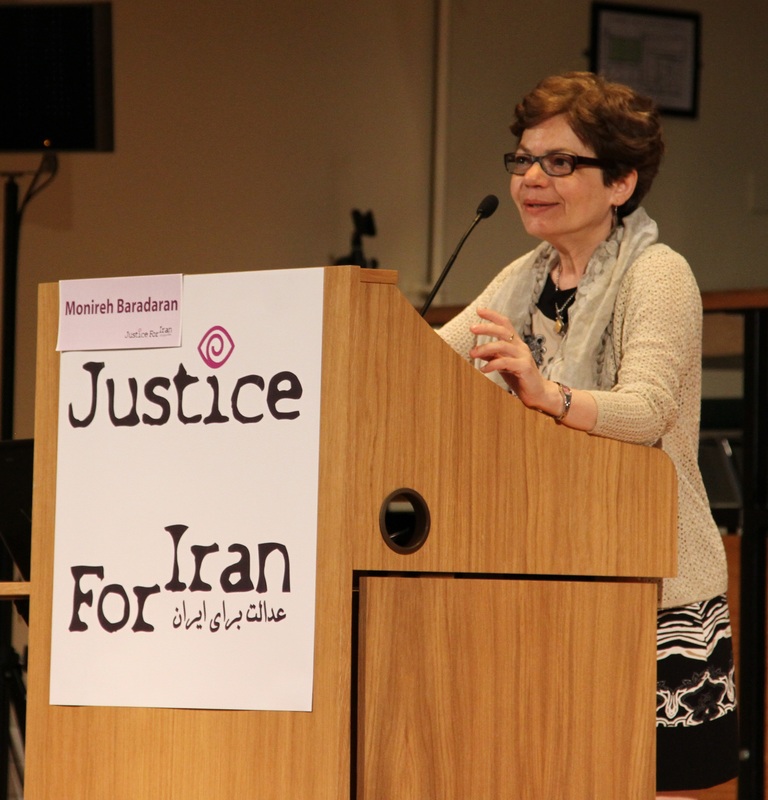 Iranian women have been and continue to remain actively engaged in a single social cause that strives to seek justice. In the midst of such women, there are Mothers of Khavaran whose roles are particularly noteworthy for their names have become intertwined with the cause itself. These women are mothers or other female family members who have lost their loved ones during the political turmoil of the ‘80s or the mass killings of political prisoners in the summer of 1988. http://justiceforiran.org/news/ahmad-shahi/As they stood behind prison walls, waiting for a chance to see their children, these women were introduced to each other, and a bond of kinship grew among them. During the summer of 1988, when prison visits were abruptly cancelled, they felt the pending, ominous tragedy as it unfolded within those walls. At the end, thousand of prisoners were massacred. But there were no protests; no one raised a voice to condemn the killings. The mothers, though, shared their grieves together. In their solitude, they gathered and searched one cemetery after another. Eventually, all the information uncovered led them to one location. Their loved ones were buried in Khavaran inside mass graves. Before long, Khavaran became their meeting place, where they gathered to mourn the loss of their own and to share the grief of another. In time, they rose above the traditional role often played by mourning mothers. The passive image of grief- stricken women was no longer appealing to them. Subsequently, the movement morphed itself into a campaign in pursuit of justice. As citizens of the society, they demanded their rights to know what had happened to their children and sought to petition the government for a redress of their grievances. Their pain was no longer a personal, private matter. Instead, it became an important social and political cause that sought the truth and demanded answers from government officials. They had known each other for years. First in front of prisons and then in everyday life, they had comforted and stood by one another, time and again, throughout the loneliness of their agonizing plight. A shared pain tied them together. In fact, a large number of them had met each other long before the revolution; they had been standing behind prison walls during Shah’s reign too. Even then, the families of political prisoners remained active and took steps to protest. For instance, they held ceremonies to commemorate executed prisoners and protested in Qom and Tehran’s bazaar in 1971 to stop future executions. Later on, they began a hunger strike in 1978 to draw attention to the plight of their imprisoned children. And finally, in January 1979, they staged a magnificent sit-in at the main courthouse in the capital to free the remaining political prisoners. The experiences gained by the families of dissidents during Shah’s regime and the memories of protests, especially the successful ones, laid the foundation for future actions in the ‘80s. As the new government began to crackdown on the opposition groups, the mothers found out that their ordeals were far from over. Even though their children were freed in 1979 and welcomed with bouquets of flowers into the arms of chanting masses, a large number of former political prisoners were later arrested and executed by the new regime. However, if we study and compare the families’ activism during these two periods of time, a marked distinction reveals itself. Before the Islamic Revolution of 1979, the executed political prisoners were considered martyrs belonging to particular groups which identified themselves with a number of righteous causes. The families of the fallen, therefore, maintained their ties with these political groups and followed their lead. But after the establishment of the Islamic Republic of Iran, the mothers of political prisoners gained new experiences, albeit rather painful and horrific ones, as they set out to protect their children. Although the two periods aren’t far apart, the extent of crimes committed by the new regime was so vast and shockingly horrendous that it had a distinct effect on the families of the slain. The mothers, all of a sudden, were drawn to new concepts rarely discussed in the society. Over time, the guiding principles of human rights replaced the political idealism of the past and, therefore, became the leading cause of the future. Years later, Mothers of Khavaran wrote a letter to President Mohammad Khatami but never received a reply from him. They even appealed to international human rights organizations to no avail. In January 1990, when the United Nations Special Representative, Mr. Galindo Pol, visited Iran, they gathered in front of the United Nations building in an attempt to see him but faced violent crack-down by the security forces. In 2002, Mothers of Khavaran wrote another letter which was addressed to the Special Rapporteur of the United Nations. If we pay careful attention to the language and tone used in these letters, we see an important trend. The letters are not filled with complaints of victims attempting to look innocent in order to solicit sympathy from readers. Quite to the contrary! The only voice heard in these letters is the cry for justice, a cry belonging to a group of women who have abandoned the stereotypical role of mourning mothers as helpless victims. These correspondences have also served other purposes: They have allowed the mothers to formulate their demands unequivocally, have given direction to their cause, and have made their presence in the country’s political and social scene known. All of their letters were authored and delivered collectively by the members of the group gathered to act as one. Even more important was the determination of the mothers to meet at Khavaran on a regular basis so as to maintain their on-going presence on the grounds of the cemetery. These gathering were larger and more noticeable especially during the anniversary of the mass-killings and also around the Persian new year celebrations. Obviously, Khavaran isn’t just another ordinary cemetery. In fact, the majority of family members who gather there even don’t know exactly where their children, spouses or siblings are buried. Khavaran, indeed, has become a symbol. It is a location where the truth lies underneath mounds of dirt, among the bones peaking through the ground, inside mass graves, around the unmarked tombs, and in the presence of mothers who bear witness to the crimes committed against humanity. So on and on it goes at Khavaran: The age-old struggle between two social forces that face each other. One seeks the truth as the other denies it. But this struggle isn’t only a symbolic, historical battle between two forces; it is a real, physical confrontation, an enduring war between the mothers who seek the truth and the security forces who refute the truth. It is a fight between those in pursuit of justice and a regime that refuses to take responsibility for its actions. Today, Iranians from all walks of life owe much to Mothers of Khavaran. These women have taught us to seek and cherish justice throughout our society. With their actions, they have introduced the vocabulary of human rights into our everyday conversations and have enhanced our understanding of those unalienable rights. Fortunately, such concepts have, to some degree, found their way among us and are here to stay. Twenty five years ago, the Islamic regime in Iran ordered each and every one of the families to remain silent about the execution of their loved ones. Despite the threats, Mothers of Khavaran decided not to heed the authorities’ warnings. On those days, the mothers didn’t know that their refusal to comply with the order will become the catalyst to a cause in pursuit of justice. These women founded a tradition that, later on, led to other movements. In fact, a year after the grieving mothers spontaneously gathered to form the organization called Mourning Mothers, they changed the group’s name, becoming Mothers of Laleh Park. During the summer of 2009, when the regime opened fire on street demonstrators, hundreds of women gathered every Saturday at Laleh Park in Tehran to protest against the killings. Iranian women used the Internet to outline their demands, asking for the violence to cease, political prisoners to be freed, and the culprits to be tried and punished. This movement was welcomed by Iranians in exile, and in response, various groups were formed abroad to support the activists inside the country. These organizations still remain engaged throughout the world. In conclusion, it is important to point out that as the direct result of what Mothers of Khavaran have done, Iranians now remember the executed political prisoners. We honor them because they bravely fought for freedom and justice and stood up to powerful, brutal dictators in an atmosphere of absolute repression. Today, commemorating the fallen has become anonymous with seeking justice. All this has become possible because Mothers of Khavaran took their infinite, private grieves and turned them into a cause. From the moment that their personal losses entered the public domain, Mothers of Khavaran were able to illustrate that their demands were those of the whole society. Indeed, the country now craves justice as much as it needs to remember the slain.